I purchased and hulled so many strawberries for this sorbet that I felt like I personally depleted an entire strawberry field. Here’s the story. I try very much to only buy organic fruits and vegetables, especially if they are on the “dirty dozen” list. Living in NYC we have access to lots of moderately priced (I know, shocking) organic options. Trader Joe’s carries many items as does Whole Foods, and of course the plethora of farmers markets in NYC makes it even easier to find great produce. When making this sorbet I went on a hunt for good priced organic berries and after 3 places I found myself, yet again, at Trader Joe’s. They really are a savior here in NYC. Then came measuring the ingredients. My recipe called for 2 quarts of strawberries, yet the only box of berries available at Trader Joe’s was 2 pounds. “How do you measure quarts in dry goods and how does that relate to pounds?”, you ask. Well, I was wondering the same damn thing myself. I whipped out the iPhone and kept googling every possible combination of “quart + strawberry+ measurement” and found myself on this totally unreliable message board that, funny enough, seemed to have a relatively legitimate post. 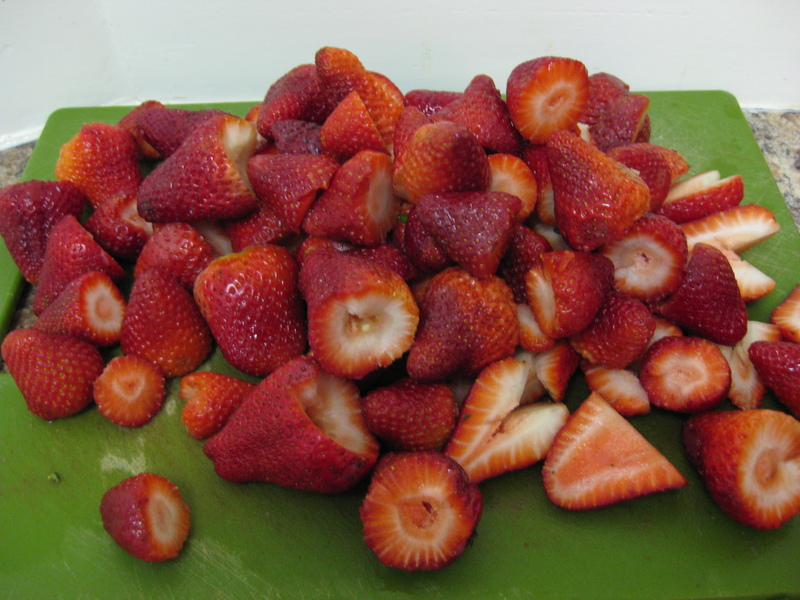 Two quarts of strawberries, it said, was the equivalent of 8 cups of berries. In other words, one pound of berries was approximately 4ish cups. I wasn’t entirely sold (and neither was my very nice salesman at Trader Joe’s) so he took the box of berries in the back and systematically measured the box for me. He concluded that one pound of berries was indeed approximately four cups. Lifesaver! So, I bought 2 quarts of strawberries and went on my merry way. Next came making the simple syrup. Simple syrup gets its name because, well, it’s extremely simple. 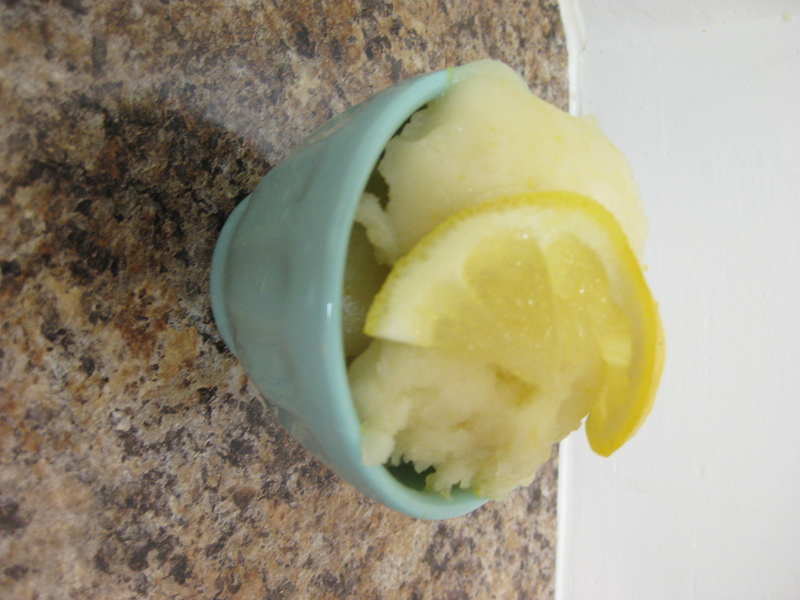 Though the classic simple syrup recipe is 1 part water to 1 part sugar, this sorbet recipe was slightly altered. In fact, it had less sugar (which is a good thing because these berries were SO sweet on their own they barely needed sugar!). I used organic raw sugar (which has a brown hue) to make the simple syrup. Two cups water, 1.5 cups of sugar. When it was done boiling and mixing it looked like a cup of rusty water. Ew. I thought maybe I burnt it, and was rather annoyed because I didn’t want to waste it and make it again. Then it dawned on me that it was brown because of the raw sugar! I tasted it for good measure, and sure enough, it was exactly right! Phew. If you thought the above seemed complicated, just wait until I regale you with the trials and tribulations of hulling strawberries. You should know that I have never hulled a strawberry before. I know, it’s a cooking faux pas. But honestly, I can’t really taste the difference between hulled strawberries and those with their tops cut off. Uh oh, am I starting to sound like The Husband with my unrefined palette? Eek. 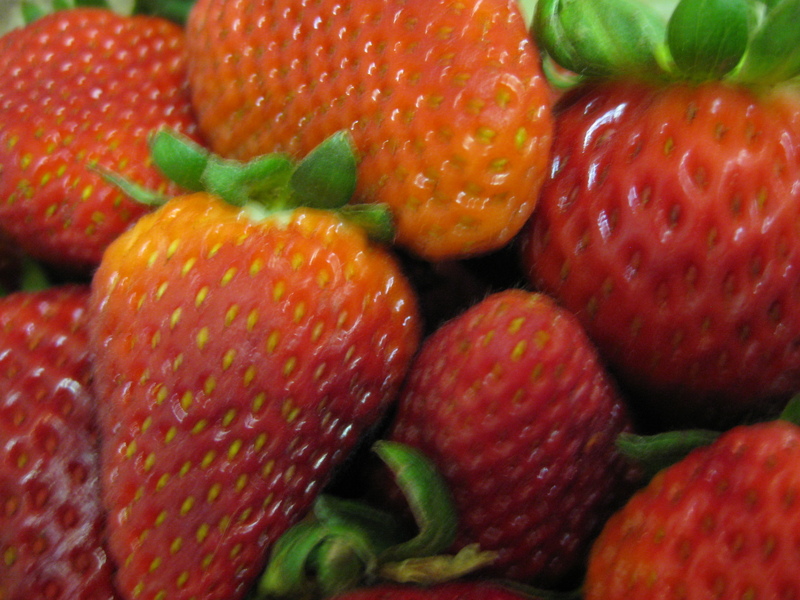 Anyhow, for those of you who don’t know how to hull strawberries here’s a great video. I watched it, practiced a few times, and voilà, I was hulling strawberries ad nauseum. But, “to hull” with this – it’s time for the actual recipe! Hull the heck out of those strawberries! Make the simple syrup by heating the water and sugar, whisking or mixing vigorously so the sugar dissolves but the water does not boil. 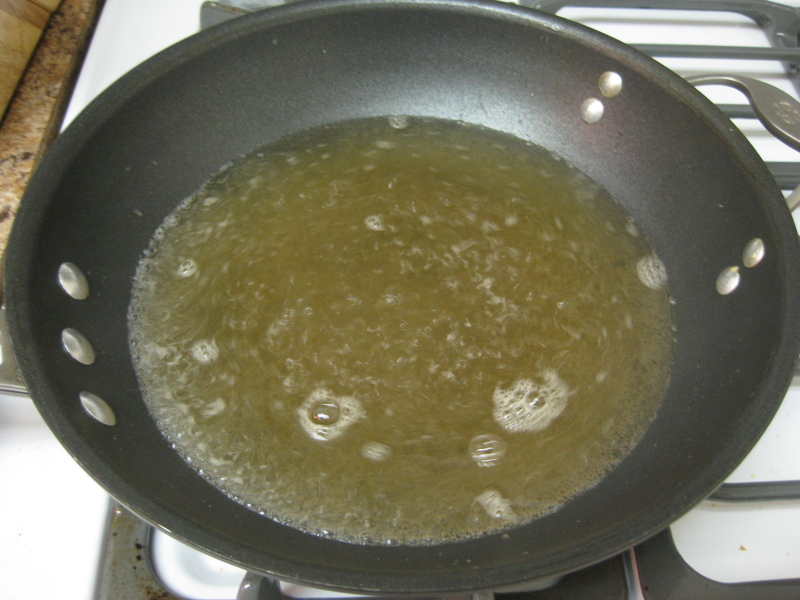 The mixture is ready when small bubbles appear around the edges of the liquid. Let it cool completely at least 4 hours or if possible, refrigerate overnight. 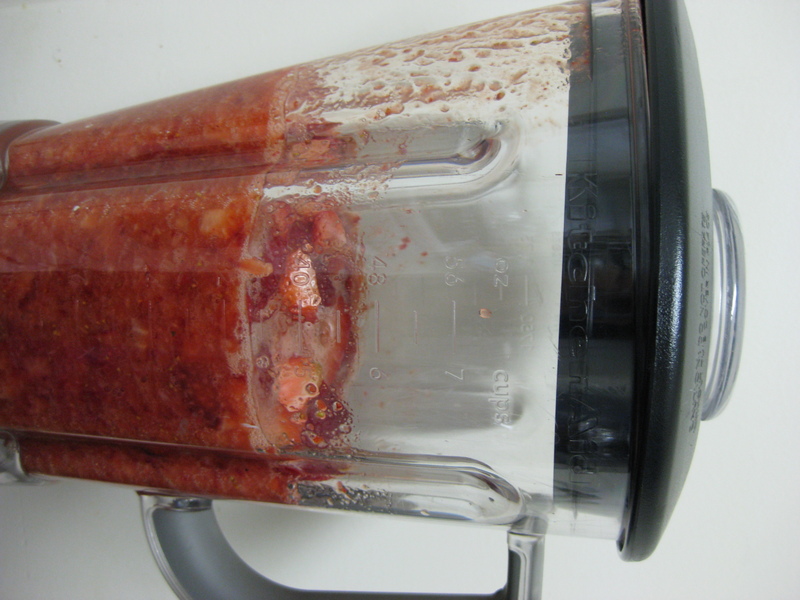 Mix half the strawberries with half the simple syrup and 1/2 tbs of lemon juice in a blender until smooth. Pour it into an ice cream maker and repeat with the second batch of strawberries, simple syrup and lemon juice. Turn on the ice cream maker and churn according to the manufacturer’s instructions. For me, this took 25-30 minutes, slightly longer than usual, and that’s because I think the ice cream maker was over crowded. It’s worth noting here that my ice cream maker has a 1.5 quart bowl and this was way too much liquid for the bowl. Actually, this makes 2 batches of the sorbet, in other words nearly 3 quarts. So, either cut the recipe in half to make only one batch OR refrigerate one batch overnight and repeat the process the next day. I actually did something rather outlandish (and delish! ), and I used the other half of the mixture to make drinks for friends. We mixed the fresh strawberry puree with some vodka and a splash of orange juice, served them in martini glasses and they were a HUGE hit. I highly recommend this option because everybody wins with sorbet and cocktails! What’s not to love? The sorbet is really creamy and “melty” when it comes out of the machine so like usual you should freeze it for a few hours before serving. When I served this sorbet I created a trifle-like presentation by layering last week’s lemon sorbet with the strawberry sorbet. It was a perfect marriage of tart and sweet. If you recall, I felt that this lemon sorbet was way too tart, but the strawberry sorbet really cut that tartness and it was a really refreshing end to our, drum-roll please… pizza dinner! Oh, and one more thing: this sorbet was so good, I didn’t manage to get a photo of the finished product. You’ll just have to imagine. Or better yet, make your own and try it! 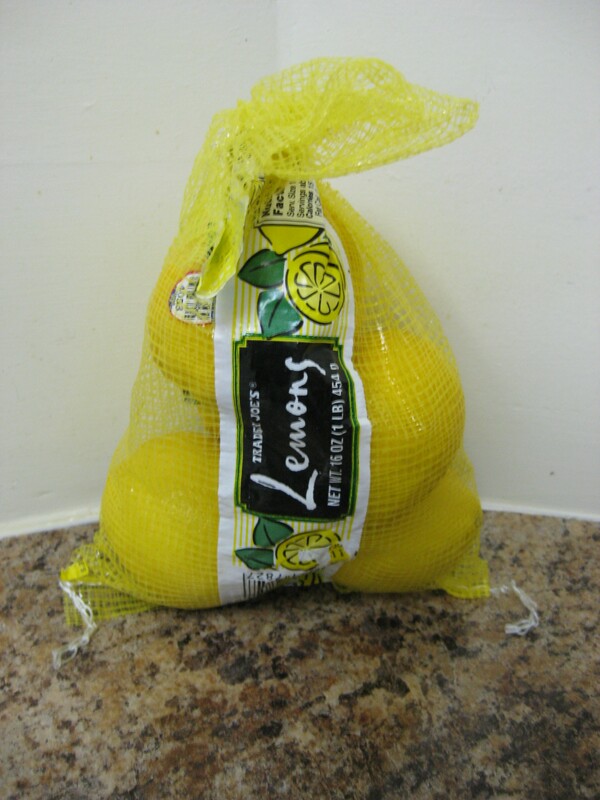 Life has by no means handed me lemons, but I felt this quote was appropriate for the upcoming recipe. I am headed to Miami this weekend to soak up the sun for one of my closest friend’s bachelorette weekend. I don’t have time to pack, get organized and make a complicated ice cream. Besides, those of us with tummy issues are having trouble enduring the past 3 days of all dairy. Help is on the way in the form of simple lemon sorbet. Truth be told, I also happen to have all the ingredients for lemon sorbet in the apartment, so why not save a few buckaroos and use what I have to make a yummy frozen treat. Living in a small NYC apartment its slightly hard to stock a kitchen with every last cooking utensil. I have accumulated quite a collection over the past few years, but still don’t have a microplane. So when zesting lemons I use, drumroll please, a cheese grater. (Thank you to my sweet coworker for the brilliant suggestion!) Seems sort of tacky, but wow, it does the trick! The magical lemon squeezer in action. There is one kitchen utensil that I do have and cannot live without. I recently purchased this squeezer in Israel and it was a total impulse buy (but at $2 it didn’t really matter). At first I thought it was a real gimmick and piece of junk. Then I tried it, and it was truly a lemon juicer miracle machine. Measuring a whopping 2 inches, it’s about the weight of a few paper clips and looks a little bit like a screw. 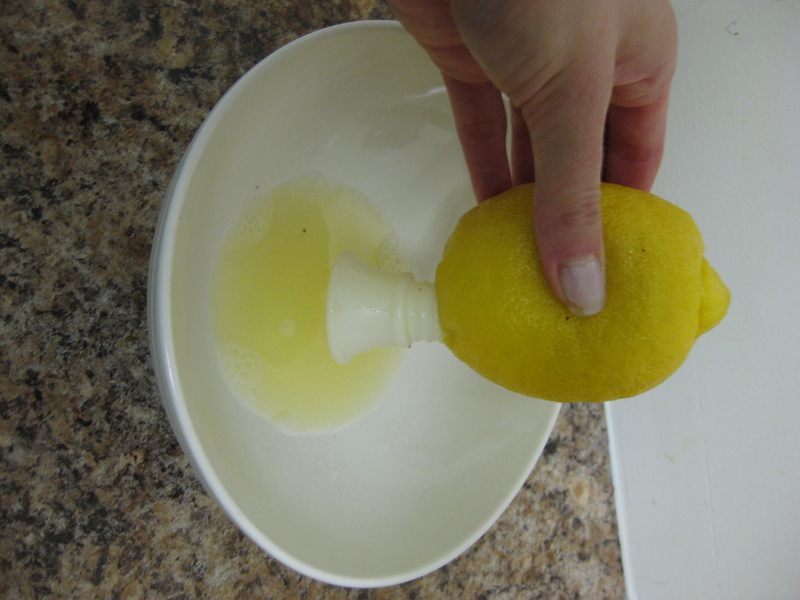 The magic is that it screws into the lemon and enables you to squeeze juice out of the spout without having seeds end up into your lemon juice. It’s extremely easy to use. Now here is where I would love to insert a link to this treasure, but I have spent the past 20 minutes searching google and have yielded nothing. Next time you’re in the market in Tel Aviv, pick one up for yourself. On to the recipe…To be perfectly honest, I had an idea of how to make lemon sorbet – I figured I could make lemonade and then put it through the ice cream maker. Duh. But I wanted to make sure someone else (hopefully a trained chef) had tested a recipe first before I put it out to you all. I googled lemon sorbet and literally 1,000 different recipes came up, but I decided to go with Emeril’s Lemon Sorbet. After making (and tasting) this recipe, it seemed more like an intermezzo or palette cleanser to me. In other words, it was so tart the way I made it that it would be better eaten in a small portion to cleanse the palette between, say, a salad course and a fish course. Nonetheless, if you follow the recipe below (and not the exact recipe I used) I think you’ll enjoy it. It’s safe to say that if you like lemons, lemon zest and tartness, you will like this. If not, add a little extra sugar, add a few raspberries on top, and you’ll love it. Bring the water and sugar to a boil in a small saucepan, remove from the heat, and cool completely in the refrigerator. Combine the syrup with the lemon juice and zest and pour into the bowl of an ice cream machine. Freeze according to the manufacturer’s instructions (which in my case was 22 minutes in the ice cream maker). The sorbet was very soft when complete. 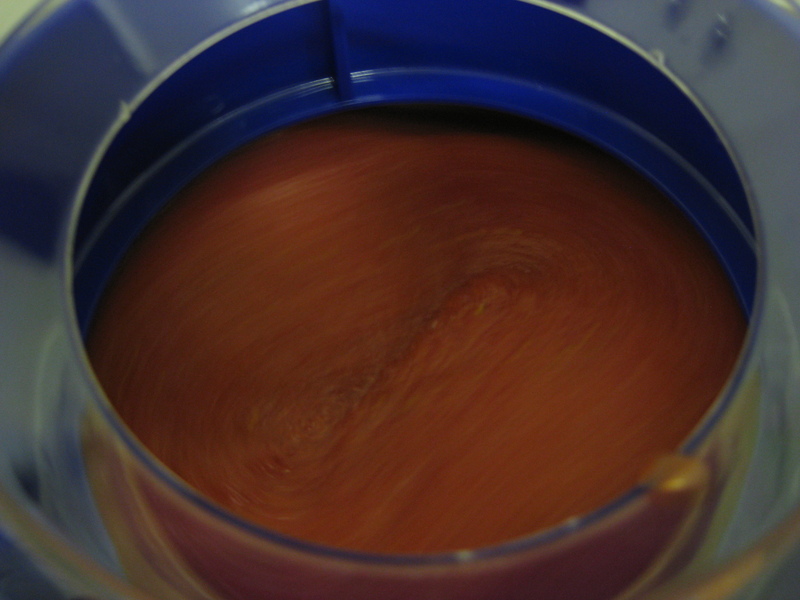 After the sorbet is made, transfer to an airtight container, cover tightly and freeze until ready to serve.